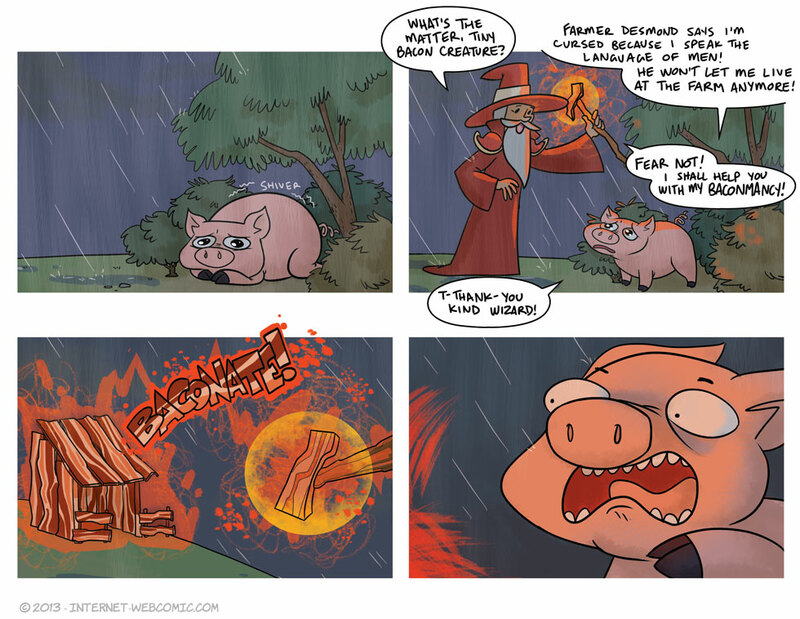 Oh Bacon Wizard. Will anyone ever appreciate your unique talents? Poor piggy, he looks so adorable. He just has to wait until the internet is invented in his universe, and then, viola! His soulmate is probably the cooking witch or something. This should prove, that wizards have no real sense of right and wrong, but they try to be the nice guys after all. Just read all of your comics! Achievement get? The problem is the lack of eggs. How can you have bacon without eggs? The Bacon Wizard shall meet his match in the Ovumancer! The egg wizard isn’t around, duh. Where the hell is chicken wizard when you need him??? Okay, wow, this one was really funny!